Here is one that WinWorld does not actually have yet, but now at least we have the associated clip art product disks. Visual Communications Network's ExecuVision was supposedly the first full blown business presentation package for the IBM PC. That claim is a little subjective. 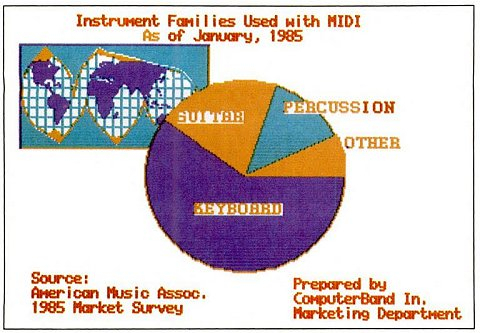 Everyone and their dog was cranking out BASIC code to draw pie charts or bar graphs well prior to 1984. 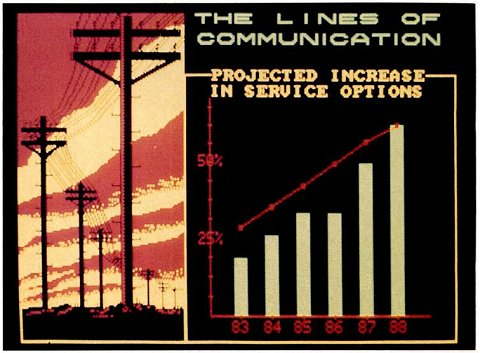 By 1984 there were already a number of plotting, drawing, and charting applications on various platforms. But ExecuVision seems to be the first that contains all of the elements - charts, drawing, animation, slideshows, clipart - that today we consider standard with a presentation program, in one package. ExecuVision was targeted at business professionals, and was advertised as a complete graphics art department on a computer. Remember, when this was first released, most people were still producing presentations with rulers, markers, paper, scissors, and paste. It received a lot of press and a number of reviews. 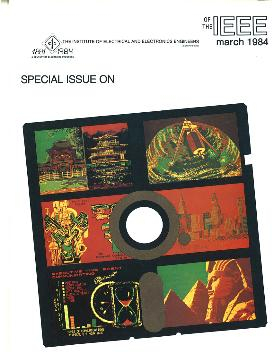 ExecuVison was on the front cover of a special issue of the March 1984 IEEE (Institute of Electrical and Electronics Engineers) publication. It was considered a game changer as now business professionals could easily and relatively inexpensively do things themselves that was normally done by an art department. ExecuVision was considered relatively easy to use. It featured free-hand drawing, animation, line, bar, and pie charts, and the ability to cut, paste, combine or move clipart images. It supported data imports from VisiPlot and VisiTrend. At release there were already some business GRAPHICS programs, such as PFS:Graph, and Fast Graphs, as well as animation programs such as 4 Point Graphics. But ExecuVision put everything together in one single PRESENTATION package, and threw in a set of clipart for good measure. Each were sold separately but a demonstration disk with some assorted clipart was included with the application software. Bizarrely, even though there is no program code on these disks, they are copy protected. According to the manuals ExecuVision's file manager will refuse to make direct copies of the clipart. It is possible that the program might refuse to load the files if the copy protection is not present. According to reviews, ExecuVision was more screen oriented. That is, you would make your presentation directly from the computer screen rather than printing it out. Also according to the reviews it was initially somewhat limited in its printer support, mainly supporting the dot-matrix Epson printers. At release it seemed to only support IBM CGA, which was extremely limiting with only 4-color graphics. Although many enhanced third party video cards were already in the works. Reportedly it ran under IBM PC-DOS 1.1 and 128K of RAM. Interestingly this software was published through Prentice Hall Inc, and unlike most manuals it was given an ISBN number. As such there is a spammy vacant placeholder page on Amazon.com for this product. PC Illustrator, Computer Graphics Group, Inc.
Executive Presentation Kit, Koala Technologies Corp.
BPS Business Graphics, Business & Professional Software Inc.
Boardroom Graphics, Analytical Software, Inc.
VCN ExecuVision, Visual Communications Network, Inc.
Condor Graph, Condor Computer Corp.
Business Graphics System, Peachtree Software, Inc. In the end, it is not entirely clear what happened to ExecuVision. 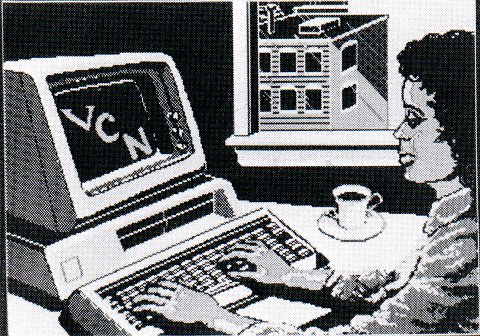 Its immediate successor was "VCN Concorde", a very high end presentation program targeted only at large corporations. Presumably both were buried in the avalanche of competing presentation programs. It is also notable that in recent years, Microsoft has stopped providing clipart with their Microsoft Office product. Well, I guess you don't need fancy art to print an "out of business" sign.